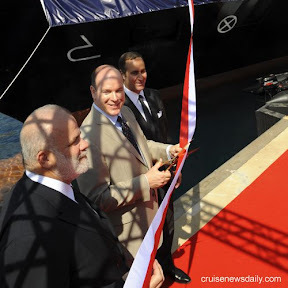 With a snip of a ribbon yesterday (June 3, 2008) in Monaco, HSH Prince Albert II of Monaco named Silversea's new expedition ship Prince Albert II. 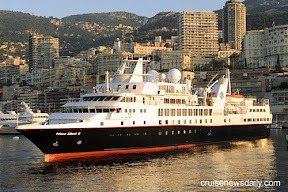 The ship will enter service on June 12 with an expedition from London to the Arctic Circle. In this CND article we looked at the reason why a cruise ship is almost never delivered late anymore, and why so many actually enter service before the original inaugural date the cruise line sets. These "early" deliveries have created problems for cruise lines in that many people who book the inaugural don't just want to be one of the first to sail on the new ship, they want to be on the first sailing no matter when it is. It seems that never really occurred to the cruise lines. In the CND article we looked at why that detail escaped their attention. Some cruise lines are now understanding that some of their customers want the experience of being on the inaugural cruise and they will change their date willingly to do it. Recently, when they decided to put their new ships into service early, both Princess and Celebrity have employed a solution that comes with a risk to them. For passengers on the inaugural sailing, they have made duplicate reservations on the new inaugural date giving them both same stateroom and their original fare. They then have allowed them a couple of weeks to decide which they want. Of course the risk for the line is that it moves them closer to the sailing dates knowing that they are holding one reservation that will certainly be canceled, and the closer they come to sailing date, the more risk there is to the line that it will be harder to sell the unused space. CND heard from executives at both lines about how popular the decision has been with customers. The complete article was published in the June 2, 2008, edition of Cruise News Daily.